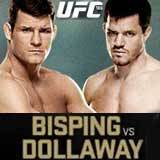 Review by AllTheBestFights.com: 2015-04-25, good exchanges between Michael Bisping and CB Dollaway: it gets three stars. The Tuf 3 light-Hw tournament winner Michael Bisping entered this fight with a pro mma record of 25-7-0 (76% finishing rate) and he is ranked as the No.12 middleweight in the world while his opponent, CB Dollaway, has an official record of 15-6-0 (60% finishing rate) and he entered as the No.11 in the same weight class. Both fighters fought three times last year: Bisping lost twice, against Tim Kennedy (=Bisping vs Kennedy) and Luke Rockhold (=Rockhold vs Bisping), but between these two losses he beat Cung Le (=Bisping vs Cung Le) while Dollaway won over Cezar Ferreira (=Dollaway vs Ferreira) and Francis Carmont (=Carmont vs Dollaway) but he was defeated by Lyoto Machida in his last bout (=Machida vs Dollaway). Bisping vs Dollaway is on the undercard of Demetrious Johnson vs Kyoji Horiguchi – UFC 186. Watch the video and rate this fight!